Happy Tuesday! I hope everyone had a great holiday weekend. Not only was it Passover and Easter, but it was also my birthday! (You can see my birthday post here.) I took Monday off, giving me a long weekend, and spent it with my family in Killington, VT. We did a lot of celebrating (I'm still recovering, ha) and on Sunday we hit the slopes. Although it wasn't the spring skiing I was hoping for, as it was only 35 degrees, the skiing was great! The mountain wasn't crowded at all since it was a holiday, which also meant no lines for the lifts! My type of skiing. These photos were taken over the weekend in Killington, as you can see the mountains still have so much snow. This is the outfit I wore Saturday, as I wanted to share a typical outfit I wear for a casual look in the spring. This sweater is now a couple of years old, and is still one of my favorites. I love how it's slightly cropped with a swing bottom, and paired with ripped jeans it's one of my favorite outfits. Because the roads were all muddy and there was still snow, I wore my rain boots all weekend. (I had already put away my snow boots, and refused to pull them out.) 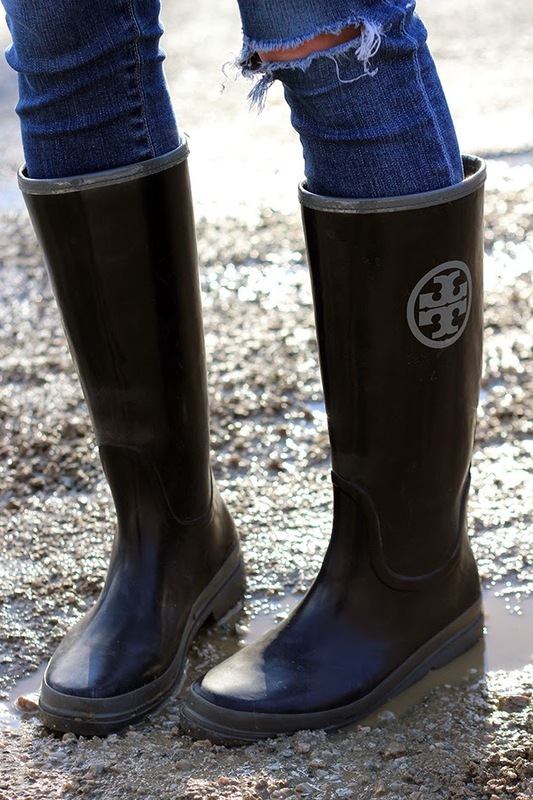 I love these Tory Burch rain boots. I have to admit, when I initially went shopping for rain boots I was going to buy Hunter, but hated how big they made my feet look! Instead, I left with these Tory Burch ones, and have been very happy with them in the rain and mud. You look so pretty! This looks like the perfect outfit for your weekend in the mountains. Sounds like it was full but fun with the holiday and your birthday. Thanks so much for stopping by! You look gorgeous! Love this casual look and those Tory boots are amazing!